Every now and then the two facets of my life come together in a moment of perfect harmony. This happened recently as I researched the Blue Zone of Sardinia for our Age-Well Project – which also happened to be the same time I was completing research for my novel, Frieda: The Original Lady Chatterley (which published yesterday and is currently – to my great excitement – The Times Book of the Month). 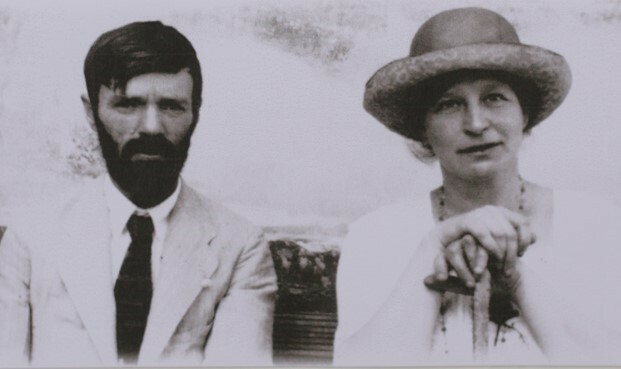 Frieda, wife of writer, DH Lawrence, and the inspiration for his Lady Chatterley, travelled with Lawrence through Sardinia at precisely the time its current centenarians were being raised. Could I learn something? His descriptions of the food make grim reading. He and Frieda have to wait hours for the food to be cooked over fires. When it comes, it’s invariably spit-roast meat (sometime palatable and sometimes not). There are few vegetables, but always olives. A typical meal was meat, olives and some bread with the local firewater (Aqua vitae), red wine and coffee. In the morning there was no food anywhere in the town until a delivery of bread arrived (which was often late in the day). He and Frieda complained about the lack of breakfast and left the area as quickly as they could. The rooms were cold, the food sparse, the landscape unforgiving and the people unfriendly, they said. The Sardinian community Lawrence describes in 1921 displays many of the things regarded as age-protective: an active population (always walking, tending their vines, turning the spit, cleaning, gardening); regular consumption of red wine; organic and pesticide-free meat and plants; communities with a tradition of trust and mutual support; regularly going hungry (aka fasting); sunlight which means Vitamin D and – we suspect – other health-enhancing properties; limited pollution and limited ingestion of chemicals. But it’s the ‘grit’ that makes this region of Sardinia so distinctive. In this remote, barren landscape life was tougher than anywhere else in Italy. Lawrence’s account of travelling with Frieda in the Blue Zone region of Sardinia is a salutary reminder that life in the Blue Zones wasn’t all sunshine and roses and vegetables. A large project is now underway to map the genome of these long-living Sardinians and we’ll keep you posted. In the meantime take what you want from Blue Zones research – but keep asking questions. The centenarians living in many of these longevity hotspots were born and raised a long time ago often in great hardship. Historical accounts (like Lawrence’s) remind us of this. Keep moving, stay resilient, build a community of friends and family, enjoy a little social red wine and coffee, appreciate your elders, don’t over-eat and don’t be afraid of the odd hunger pang. As I write this, some new research pops into my in-box, suggesting that lifting weights for less than an hour a week can reduce our risk of heart attack and stroke by 40-70%. Going beyond an hour provides no additional benefit, says the lead researcher, adding “Lifting any weight that increases resistance on your muscles is the key. Muscles don’t know the difference between digging in the yard, carrying heavy shopping bags or lifting a dumbbell.” (Study based on data from 13,000 adults in the Aerobics Center Longitudinal Study). The centenarians of Sardinia never lifted weights. But they were constantly using their muscles as they turned spits, split firewood, changed sheets and dug the rocky barren soil they depended upon. This is the Sardinia so brilliantly evoked by Lawrence. And while we have no desire to forego all our mod cons, perhaps it’s time to get back to some of the old ways – like walking to the shops and carrying a bag of shopping home as our parents and grandparents did. Alternatively keep a pair of weights by your kettle and do a few reps while your tea’s brewing. Sea and Sardinia by DH Lawrence was written and published in 1921. Some of the children he described are still alive and, quite probably, the subject of several studies into longevity. « WHO’S RESPONSIBLE FOR OUR HEALTH? Great post – congratulations on your book and what a wonderful crossover! I will suggest it for my book club, along with LCLover. That’s all very well but if, like me (72), you have led a very physical life playing lots of tennis and walking the dog for miles and forever being outside if the weather permitted you end up with hip problems, knee problems, shoulder problems and back problems… the engine is still ticking over solidly but the infrastructure is creaking and cracking and you find you are taking strong anti-inflammatories and pain killers and the docs tell you to rest. Then you lose muscle tone and put on weight. And the dog gets fed up with shorter walks and you have to skip tennis until things settle down and you can’t do the weights in the bathroom as your rotator cuff is screaming. You need to swim more which is fine if you are living somewhere warm but not much good in London. So you need a personal trainer. Someone who can navigate round your worn joints and strengthen the muscles supporting those joints. And where do you find one of those…how do you afford one of those ?….It’s Catch 22 I’m afraid. Do what’s good for one thing and you’ll break something else. Good luck with the book. I hope it answers my questions. Sounds as if you’ve been doing all the right things, Michael. WE agree – we’d like to see many more classes for older people with properly trained instructors who understand the wear and tear of ageing – and at a very cheap price. We suspect this might be a much better NHS investment than some of the endless medications routinely prescribed. Good luck!